“Crisp” is not a word that leaps to mind when you think of avocados. I had to try this to believe it. It works, it’s easy, and they are delicious! Have ready a rack for drying avocado slices. Whisk the egg white in a small bowl. Whisk in the cream and optional hot sauce and set aside. Cut avocado in half lenghways around the seed. Carefully, smack the blade of a chef’s knife into the seed and twist it out. Cut halves into two wedges and remove peel. Cut avocado pieces into 1/2-inch wedges and sprinkle with salt and pepper. Stir pork rind crumbs or almond flour, Parmesan cheese, and a little more salt and pepper together on a plate. 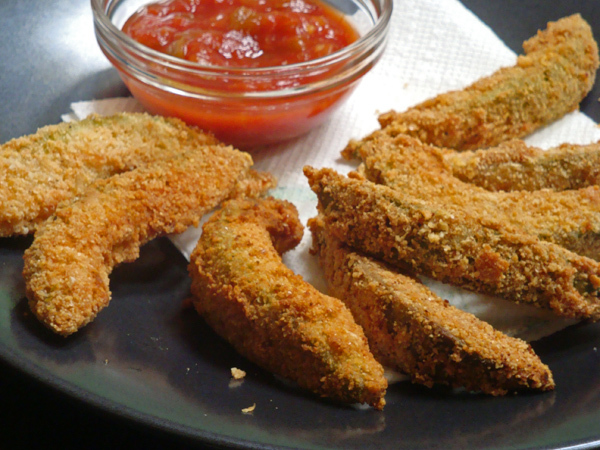 Dip avocado slices in egg-white mixture, let excess drain away, and dredge in pork rind or almond flour mixture until completely coated. Place slices on rack to dry for about 5 minutes. Heat 1 and 1/2 inches of oil in a fryer or deep skillet to 375 degrees F. Fry avocado slices for about a minute or until golden brown. Remove with a slotted spoon or spider and drain on paper towels. Serve with lime wedges and ranch or blue cheese dressing, salsa, or marinara sauce, if desired. Recipe adapted from chef Trey Foshee at George’s in the Cove in La Jolla, California. “NOURISHED” NOW AVAILABLE ON KINDLE AND NOOK! I would have never thought about frying an avocado. Can't wait to try this recipe. Yum! Avocados? Fried? Oh my! This sounds fabulous–classes are just ending for me so I have time to cook again. I know what I'm going to try first! These sound tasty! I really wish you had a pic so I could post this to Pinterest. Oh thanks, Ken, that would be great! I'll make some more and take picture for you tomorrow. Here's the picture, Ken. My avocado wasn't ripe yesterday, so I had to make the fries this morning. Sorry for the delay. Yes they are yummy, but I may reduce the serving size–they are really rich and filling. Just a couple of fries is plenty for me. Wow! Have to try these. We have fried avocados down here and everyone says, OMG, Tex-Mex! But haven't thought about cutting into fries and then breading! Wow, this is one of the most awesome looking recipes I've seen lately! Must try! Just wondering which one you believe works better: pork rinds or almond flour? Can't wait to make these. Anonymous: I like them equally well, but the pork rinds have zero carbs, so that's a plus. The almond flour is a little more convenient because it's easy to keep on hand. The pork rinds go stale quickly after you open the package if you don't use it all. The local "fancy restaurant" in my town serves these. I ate some that my mom brought home and they were pretty good with ranch, and I'm going to make these for dinner! thanks! Hi Cheyenne. Hope you enjoy them! Thanks for the comment. These look wonderful! I am going to try mine "Buffalo style" and dip them in a mixture of blue cheese dressing and Frank's Red Hot sauce. That sounds good, Brenda! Thanks for sharing. I am stuffing myself with these right now. They are awesome!!! Been trying to find a way to get more avocado into my diet. Win!! I'll practice self control the next time I make them! Anonymous: I'm glad you are enjoying the recipe! Luckily, it's hard to over-endulge on low-carb foods. Oh my gosh! These are amazing! I made these for a 4th of July BBQ yesterday, and they were a hit, even among non-low-carb dieters and picky eaters! There were some I kept for myself at home, and today, I mashed them up, mixed them with an egg, and fried the mixture like a pancake. Topped with some sriracha, delicious leftover recipe!